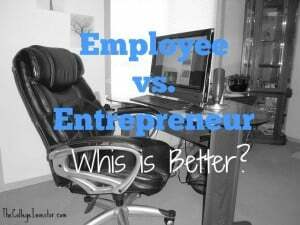 Home » Is it Better to Be an Entrepreneur or an Employee? There are countless articles on the internet claiming that being an entrepreneur is better than being an employee. But is that really the truth? I have been on both sides of the fence now and while I currently enjoy what I do, I want to dispel the myth that working for yourself is nothing but sunshine and rainbows; because it’s not. Sure there are tons of advantages of working for yourself but there are also many advantages of being an employee. Let’s take a look at some of the pros and cons of both. As an employee an average full time job consists of 40 hours per week. You go into work, keep busy for eight hours, and come home. After factoring in your commute, the time you’re committing to your day job maybe a little bit higher. As an entrepreneur your hours will vary greatly. When you’re first starting up your business you may put in 60 -80 hours of work per week. But once you establish yourself and/or outsource parts of your business the amount of hours you work can be greatly reduced. Also, you may be able to replace the income from your day job in much less time than 40 hours giving you a significant amount of free time if you don’t wish to increase your workload. As an employee when you clock out you’re done with work. You can go home to your family and forget about your job. As an entrepreneur this is a little different. When you’re working for yourself it can be really hard to get out of work mode. Especially if you work at home. Your computer and phone are always near you and it’s so tempting to check your email or do a little more work. The advantage is that depending on your business, you may get to work less hours than an employee would and therefore get to spend more time with your family and friends. As an employee my stress level was always pretty low. I went into work, knew what was expected of me, put in my hours, and came home. As an employee you don’t have to worry about where your next paycheck is coming from or running the daily operations of a business. When you work for yourself, especially when you just get started, you’re a one man (or woman) team. Your pay fluctuates and if you don’t build multiple streams of income it can diminish overnight. You also have to wear many hats. You have to provide a product or service, market, network, find suitable employees when necessary, and be your own accountant. The direction of your business is up to you. This is exciting and stressful. In my opinion there’s a clear cut winner here: being an entrepreneur is more stressful than being an employee. This is similar to work stress. As an employee you know what’s expected of you. In my last job as an insurance agent there were periods of time when we sat around and did nothing. Fall and winter months were especially slow and slacking off almost became the norm. A lot of employees put in their time and go home. They don’t go the extra mile, especially if the extra mile isn’t going to get them anywhere. As an entrepreneur it’s up to you to earn your own. Nobody is going to earn money for you. If you want to get paid you work. The amount of work you do and your product or service will be the determining factor in how much money you bring in. You have deadlines to meet. So it doesn’t matter if you don’t “feel like” doing much work on a particular day. You have to or you risk losing an income source. Now to the big one: money. As an employee your income is limited. You put in your required hours and in return you get a paycheck for the same amount each week. Sure, you can move up the chain at work but eventually your income will be capped. As an entrepreneur the possibilities are endless. The amount of money you bring in and the rate your business grows is all up to you. The sky really is the limit. There is no clear cut answer to which is better. It all depends upon your goals and your personality. Sure, entrepreneurship can bring you freedom to work when and where you want, but you still have to work. Contrary to what some of the gurus tell you, you’re not going to get far as an entrepreneur working four hours a week. It’s not going to happen. If you do think entrepreneurship is for you start a side business while still working your day job. Build up a cash reserve and commit yourself for at least six months to a year before making the switch. This way you’ll get a taste of what entrepreneurship is really like. What do you think: entrepreneur or employee? I suppose a lot of it has to do with how much you let work define you — for me, that’s the biggest difference between entrepreneur and employee. Obviously, you should be about a lot more than what you do to make a living, but it certainly plays a role. Being an entrepreneur definitely isn’t as easy as many people think. You have to work a lot and wrong decisions can have terrible consequences. I don’t think one is better than the other. You can be an employee with a lot of freedom as you can be an entrepreneur captive of your own work.